the Gulf Coast states excised from the USA. In 2056, Fen tries to remember everything that her scientist-parents taught her before Delta Fever felled them, like countless thousands after Hurricane Jesus (which made Katrina look like a mild breeze) – but will it be enough? 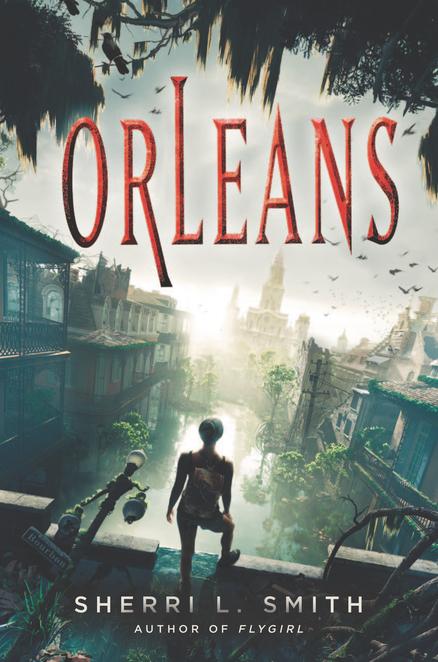 Get a taste of Fen’s life in the free short story “Orleans: Carnivale” here, then look for the 2013 hardcover or recently released paperback to travel deep into dangerous Orleans, one of my #weneeddiversebooks 48-hour Reading Challenge favorites this year. As Sherri wrote in my copy of the book, “Tribe is life” – it’s up to Fen to ensure her tribe’s survival now. Book info: Orleans / Sherri L. Smith. G.P. Putnams’ Sons, 2013 (hardcover); Speak, 2014 (paperback). [author site] [publisher site] [book trailer] Review copy and cover image courtesy of the publisher. My book talk: Carrying the hope of her tribe in 2056’s death-dealing Louisiana swamps, Fen will leverage any advantage to ensure their survival, including an outsider scientist’s misguided help. In drowned New Orleans, descendants of mega-hurricane survivors live and die in tribes based on blood type to slow the incurable Delta Fever’s mutations. After an ambush, only Fen and Lydia’s baby remain of the O-Positive tribe. She must get that baby over The Wall before Delta Fever gets into her blood! Scientists in the Outer States still seek a cure for Delta Fever; Daniel has found it. To test the cure, he sneaks into the Separated lands in a quarantine suit, hoping to survive long enough to see the results. When blood farmers capture them, Fen and Daniel work to escape so they can get Baby Girl over The Wall… at least, that’s what Fen plans. Calli, by Jessica Lee Anderson (fiction) – foster sister or rotten apple? alienating her friends and stealing Calli’s things. Now Calli wants to undo her wish for a foster sister and would turn back time in a heartbeat – but everyone knows that time only runs forward. Jessica Lee Anderson brings us another highly readable story about a teen facing unusual challenges (see my no-spoiler recommendation of her Border Crossing here) and surviving, in spite of it all. Look for this 2011 book at your local library or independent bookstore. 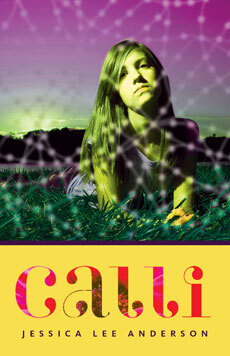 Book info: Calli / Jessica Lee Anderson. Milkweed Editions, 2011. [author’s website] [publisher site] Review copy and cover image courtesy of the publisher. Trudging home in the coastal Louisiana heat, Calli wonders why she ever wished for a foster sister. Everyone in the high school knows that Calli saw her own boyfriend Dub liplocked with Cherish, guesses he decided that he wanted action instead of affection. Whatever weird thing happened with Cherish’s family to get her into foster care, the ninth grader isn’t letting it stop her from hanging around with upperclassmen, wearing tighter shirts than Calli, more makeup than Calli, trying to get Calli to do her homework. The girls bicker constantly at home (thank goodness they don’t share a bedroom), which makes Mom’s lupus flare up. Verbal spats get physical, and now the whole family is at risk. Cherish steals from Calli, alienates her friends at school – is there anything that Cherish won’t try to take away from her? Is Dub lost to Calli forever? Will Cherish’s willful behavior keep Mom and Liz from ever having a young foster child to care for and love? Is Calli going to stay “plain old Calli” with braces forever? An insightful look at less-traditional family life from the author of Border Crossing, this novel takes readers into that humid South Louisiana spring semester when Calli’s life changes for the worse, for the better, maybe for always.